Ultrasound, high frequency sound waves above 20 kHz, and beyond our range of hearing, are in common usage in medicine. In medical use the frequencies are usually in the range 1 to 20 MHz — very high indeed. Like sonar, the sound navigation and ranging technique used to locate shoals of fish, ultrasound scanning relies on the reflections of ultrasound from the materials it makes contact with. If the speed of ultrasound is known, and the time between transmission and being reflected back is found, then the position of the reflecting surface can be determined. In this activity you will be modeling the ultrasound amplitude scan, or A-scan, which has commonly been used to examine the structure of the eye. As you can see in Figure 1, as the ultrasound entered the cornea some is reflected from its front surface giving rise to the first part of spike C; the second part of C is the reflection from its rear surface. The L1 spike is the reflection from the front surface of the eye lens and L2 from its rear surface. The first spike at R is where contact is made with the retina, and the others from the sclera — the fibrous outer coating of the eye — and from fat within the orbit. The key to detecting structures in the body is that where they differ in acoustic impedance the ultrasound will get reflected, partially reflected and transmitted further. The table in Figure 2 overleaf shows how the acoustic impedances and speeds of ultrasound vary for different body materials. where Z1 is the specific acoustic impedance of the first medium and Z2 that of the second. So, if the ultrasound beam is travelling from the aqueous humor into the eye lens, little is reflected as Ir/Ii = (1.84 x 106 – 1.50 x106)2/(1.84x106 + 1.50x106)2= 0.01 (1%) and so most, 0.99 (99%), will be transmitted. To represent the different materials in the eye you will be using coaxial cable of differing electrical impedances joined together in series. Electrical pulses of frequency near 140 kHz will be sent down them and these will partially reflect on entry, where they join, and at the far end of the pair. The speeds of such pulses down coaxial cables is very much faster than that of ultrasound — usually of the order of 2 x 108 m/s or two-thirds of the speed of light in a vacuum. The find the lengths of each of the cables, much in the same way as the distance from the front of the cornea to its rear surface, or to the front of the eye lens or to its rear surface, or to the retina, you just need to know how long reflections from their ends took and the speeds of the electrical pulses along them. You will find the speeds of the electrical pulses along the cables written on labels on each of them. 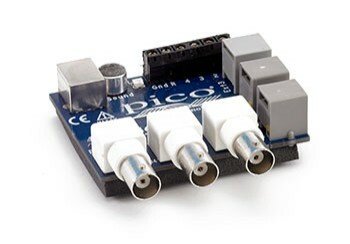 Connect the USB cable from the PicoScope 2202 to a USB socket on the computer. (If you are using an ADC-200: connect the parallel cable from the ADC-200 to the parallel port socket on the computer. Plug in the ADC-200’s power supply.) Assemble the apparatus as shown in Figure 3 with the Pulse Generator socket marked Pico connected to Channel A of the PicoScope 2202 and the Cable socket connected to cable A. Use the coaxial line. Switch on the computer and load the PicoScope software by clicking on its icon. Enlarge, if necessary, to provide a full screen display as shown in Figure 4 with the program already running. Click the red STOP button in the bottom left–hand corner of the screen. Adjust the Timebase setting to 1 µs/div;the X-gain to x1; Channel A to ±50mV, AC and Y-gain of x1. Leave Channel B OFF. Now set the Trigger to Single, (channel) A, Rising and 5 mV, and the Pre-trigger screen display to -5%. The last of these lets you set when the trace is started from, in this case the first 5% of the display is prior to the pulse triggering. Switch ON the pulse generator and click the green GO button in the bottom left-hand corner of the screen. Figure 5 shows a typical result of sending pulses down the two cables. By clicking on the beginning of the near vertical part of each pulse displayed, the times at those points will be displayed as shown for the first pulse in Figure 6. Note the time taken for the input pulse to travel to the end of the first cable and back, and from the end of the second cable and back. You will note some multiple reflections too, so bear in mind that they are likely to be the ones with a much smaller amplitude. Use the values of the speeds of the pulses marked on the cable drums, and the reflection times, to calculate the positions of the reflecting boundaries — essentially finding the lengths of each cable. The pulse travels down the coaxial cables as if they were straight and unwound. This models well how the ultrasound A-scan functions, though with ultrasound rather than a voltage pulse. Q2 What do you think the lengths were of (i) cable A and (ii) cable B? Show your working out. To finish click on File in the Menu Bar and then on Exit in its drop-down menu. Now switch OFF the pulse generator and disassemble its connections with the cables and the computer. This experiment was written by Chris A Butlin of Sutton upon Derwent, UK.